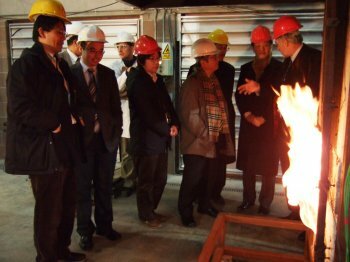 A delegation from Japan's Tokyo University of Science and Mitsubishi Plastics recently visited the University of Ulster’s Fire Safety Engineering Research and Technology (FireSERT) centre recently to discuss future research projects. University of Ulster and Japanese academics are teaming up to research the management of disaster zones following earthquakes and fires. This is just one of the areas of research Ulster’s FireSERT centre will be involved in alongside colleagues from Japan’s Tokyo University of Science (TUS). A delegation from TUS visited Ulster’s Jordanstown campus last week alongside Japanese manufacturer, Mitsubishi Plastics, to discuss the future projects. Professor Shin‘ichi Sugahara, project leader of the Global Centre of Excellence (GCOE) from Tokyo University of Science (TUS) and Dr Tatsuo Ando, from Mitsubishi Plastics, met academics from Ulster’s centre for Fire Safety Engineering Research and Technology (FireSERT). Following the success of a previous research collaboration between FireSERT and TUS, both institutions were keen to develop a more dynamic relationship which would include a research exchange programme and encourage joint research projects staffed by individuals from both institutions. Having learned of the world class fire safety research being carried out at Ulster, representatives from Mitsubishi Plastics have been keen to visit the facility and extend a working alliance with FireSERT alongside TUS. FireSERT, TUS and Mitsubishi Plastics have agreed to explore and assist in developing mechanisms that will encourage and enhance co-operative work between the institutions in areas of mutual interest in the domain of Fire Safety Engineering, for example: fire protections in the facades of high rise buildings; disaster management in fire and earthquakes combined situations using GPS systems; fire fighter protection against nano particles and smoke control and people safety evacuation in underground tunnels. Professor Nadjai added: “This agreement will enable FireSERT staff, facilities, and equipment to be used to support TUS and Mitsubishi’s research programmes supported by the Japanese government. It will also provide opportunities, through sabbatical appointments, joint seminars and visits for TUS staff to interact with the world-class FireSERT facility at Ulster. With a prominent long established national and international research profile, FireSERT is a significant constituent of the Built Environment Research Institute. Staff at FireSERT were awarded a £5.5 million JIF project in 1999 to build and equip a purpose designed environmentally-friendly, large-scale fire safety engineering research facility. The centre for Fire Safety Engineering Research and Technology (FireSERT) combines a multi-disciplinary team of scientists, engineers and psychologists in a unique laboratory facility in Ireland and within the University sector of the UK. Its aim is to promote scientifically focused cost-effective performance based fire safety engineering and provide a viable internationally competitive research resource for fire safety sciences.